Home » Blog » 5 Minute Fudge Brownies (with sugar)! Okay, just to be clear up front – it takes only 5 minutes to stir up the batter for these homemade brownies, but of course a little longer than that to actually bake them! But as I was making this batch I was thinking how it really doesn’t take much longer to make brownies from scratch than it does to add some eggs and other stuff to one of these lovely boxes of brownie mix pictured down below. Preheat the oven to 350 degrees F. Generously grease a 8X8 or 9X9 square baking dish with a little melted butter (a pastry brush makes this job super easy). Add the brownie batter to the baking dish and use the spatula to flatten out the top into one even layer. Bake for about 30 minutes and let cool before slicing into squares (if you can control yourself enough to wait - ha)! Enjoy. Previous Post: « Bacon and Hot Dog Labels Decoded! 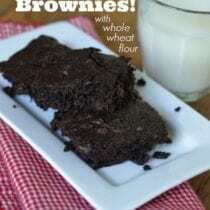 Wondering if you have a whole wheat flour zucchini brownies recipe? Yum! Almost identical to a recipe I’ve been using for several years now. It’s my go-to recipe now anytime I want brownies. I bake them only for about 16-18 minutes though and they come out fully cooked but stay chewy and soft. I accidentally left them in for close to 30 minutes once and they were still fine but texture was more cake-like and dry. Probably depends on your oven and altitude. Almond or sweet rice ? I have made these twice with almond flour. The first time I used an additional egg substitute in the form of a tablespoon of vinegar/teaspoon of baking soda (because I read that substituting almond flour often requires more binding ingredients, but instead of adding a full egg, I opted for a substitute that I have found really lightens up desserts and makes them airy). The result was brownies that didn’t rise and stuck to the pan (though they did taste absolutely yummy –wonderfully fudgy and airy). The second time, I did not add the extra egg and I put parchment paper in the pan. They rose beautifully and tasted amazing. I’ve made these too many times to count. They are delicious! I have these cooling on my counter as I type. I had all ingredients but chocolate chips. Hopefully, it will still satisfy my chocolate craving! Made these tonight with sucanat instead of sugar and coconut flour. So rich and delicious! I baked then for 20 minutes and that was perfect. These sound great, but does anyone know if it would be possible to sub the butter for organic coconut oil? I want to make these for my mother-in-law who can’t have dairy.. I made these last night with coconut oil since I didn’t have any butter. They were delicious! I add a little espresso powder to make the chocolate in these brownies really pop. Hi Lisa! I’m new to your site, I found you on Pinterest. We tried to eat on the healthier side. This fit into our perfect weekly treat. They are so delicious- so fudgy! Plus, it’s a great kids in the kitchen recipe. My four year olds loved helping me whip up the batch. Thank you so much. I’m looking forward to delving into your site after they go to bed! Oops. I meant to type- We try to eat healthier. Not “tried”. 12 eggs? Like a dozen? That’s a big bump up from 2. Can these be frozen into individual serving sizes? Looking for a little treat to send in school lunches. Thanks! Hi! Is your cocoa powder Dutch-process or natural? OH MAN! I just made these and they are perfect. So easy to make, moist, perfect sweetness just fabulous. Doing everything I can to not eat them all. These brownies are amazingly delicious! I used an 8×8 pan and baked them for 25 minutes. They are so rich and perfect, a small square is exactly enough!!! Oh my gosh, just made these and they are fabulous!!! So easy and so yummy!! I used rapadura (also known as sucanat) and the flavor was awesome! I was afraid it would be a little off because sometimes rapadura has a stronger taste than sugar in recipes. Of course, I used the mini chocolate chips so that probably helped balance it out. I did find that the brownies were overcooked at 30 minutes (my fault for not checking them earlier!). Thanks for the recipe! Can Amaranth flour be substituted for whole wheat flour? Can I sub. the chocolate chips for carob chips? Can gluten free all purpose flour be used for this? I have everything except the chocolate chips! I guess I need to get to the store! I would like to make this today! Can you substitute honey or maple syrup for sugar? This is very close to my grandmother’s recipe that I have been using for years ! So yum ! Sometimes I add a teaspoon of very finely ground coffee into the mix, too. I’ve made them with honey – they’re fine – but better with regular sugar. I used coconut sugar and white chocolate chips… YUMMY!! This recipe is AWESOME! Two days ago I covered the batter with York Peppermint Patties. My stepson’s family including 13 yo, 10 yo, and 4 yo twins, FINISHED the brownies and could not stop raving about the taste. I was a hero – thank you! So, tonight we had unexpected company. I swapped the whole wheat flour with Bob Redmill Gluten Free flour since one of our our friends has celiac. Again, I covered the batter with York Peppermint Patties. The brownies were more like a molten chocolate cake. YUMMY! Thank you for this successful and incredibly easy to make recipe! Anyone made these without the chocolate chops? They look wonderful but I just really don’t care for chocolate chips. I substituted the flour 1:1 with namaste brand gluten free flour blend and they came out perfect! Great recipe! So I have made these half a dozen times…all with great results. Today I started making them to satisfy a major chocolate craving. I quickly realized I didn’t have sugar, so I substituted brown sugar, then I realized I didn’t have any eggs, so I substituted flax meal. They turned out awesome still! I love recipes I can easily adapt to what I have on hand when I forget that I don’t have all the ingredients before I start. We love these! I didn’t have eggs and subsituted 1 mashed banana for the 2 eggs. They turned out yummy!! Thanks for sharing! These are so good and so easy. I used coconut palm sugar and whole wheat pastry flour. Delicious! Would these work with Stevia powder instead of sugar, do you think? Hi Sue. I’m no sure. We’ve not baked with stevia. This post might be helpful for you: https://www.100daysofrealfood.com/2013/04/25/stevia-food-babe-investigates/. What kind of sugar is being used in thisbrecipe? Hi Lacey. This is one of the very few recipes where Lisa uses regular sugar. i dont even know the last time i made store bought box brownies. I made this twice, and don’t know why but the first time I made it didn’t turn out. It was very dry, cakey, and tasteless. Just gave another try today, and boy oh boy, was it delicious! I only made a half batch this time to try, but it came out very fudgey. I think the key is to not bake too long, but I will have to bake a couple of times to examine what exactly went wrong at the first time. I love to bake and I consider myself a great baker. And Lisa, do you have a recipe for black bean brownies? I’ve been trying to bake it lately, and trying to find the one that is very, very good. I use the recipe from chocolate covered Katie website. We absolutely love them!! These were great. I followed the recipe exactly and baked for 25 minutes since my oven seems to run a little hot. I used the toothpick method to test for doneness, and would probably pull them out at 20 minutes next time so they are a little more gooey. Thank you! Why in the world did I ever buy boxed brownie mixes?! I gave this recipe over to my 11-year-old daughter to make on her own. I do think the dark cocoa makes all the difference (I order it off of Amazon). There is just no comparison between the dark and regular. We also used whole wheat pastry flour and it made it just perfect. 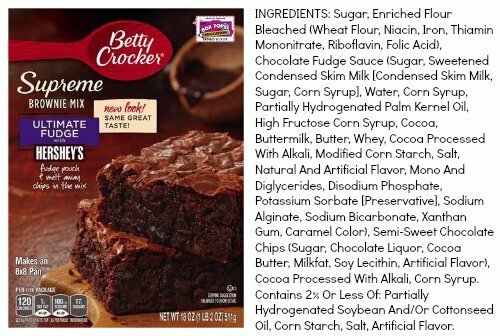 Will never buy boxed, organic or not, brownies again. This was just too easy, fast, and seriously, too delicious. I used organic spelt flour (it is what I had on hand) and I always sift all my dry ingredients before using when I bake. We only use the Enjoy Life Chips since we have food allergies in our house. These were so easy to make and beyond delicious when they came out of the oven. I would suggest to those who found it dry and cakey, you have to set it for a few minutes under the suggested baking time and then put the toothpick in it to check. If it is gooey, add 2 minutes at a time and keep checking with the toothpick. This was a trick I learned when making brownies, you want them barely done because when they come out they continue to bake a bit. I am going to make them for teacher appreciation week this year. These are super easy and wonderful tasting! I only baked 25 minutes and they were perfect. My daughter has a dairy allergy so I just substituted the butter for coconut oil, equal amount, and it worked perfectly! 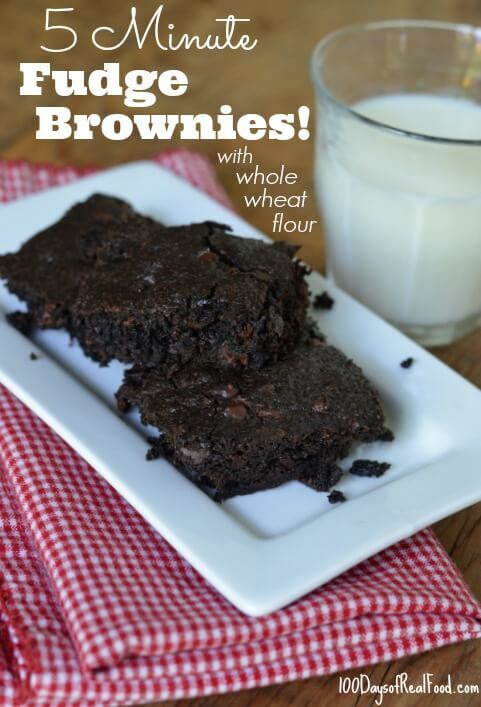 Thanks for the recipe – so nice to have good brownies without all the garbage that comes in the boxed ones from the store!!! I just made these today after the recipe came through on my Facebook feed! These are fantastic! Like another reviewer mentioned, I reduced the sugar to 1/2 cup and increased the chocolate chips to 1 cup. These brownies reminded me of a cross between a moist Texas sheet cake and brownies. A good balance between cake and fudgy flavor. I baked them for 24 minutes at 350 and did not have an issue with them being dry at all. My family gobbled them up. This recipe is a keeper. I use this ALL The time! its excellent when you want to share a plate with a group of friends, or maybe for a party! I would recommend, if you REALLY wanted too, put Nutella on top. I’d like to make these but want to use a HUGE pan. A half sheet. Should I triple the recipe!? Do you think it will come out good?? Hi there. I think that will work though it is not something we’ve tried. Could these be made with honey instead of sugar? We have not tried them with honey. I think the consistency would be off. You can try coconut sugar, but they will be slightly less sweet. IF you try honey let us know how they turn out. My daughter has dairy issues. Has anyone tried subbing some of the butter for shortening? I know it works in cookies but not sure for brownies. Yes, coconut oil will work. What do you use for sugar? Do you believe the Splenda is healthier that granulated cane sugar? I am trying to switch what I use for sugar and your input would be helpful. Hi Susan. Lisa most often uses honey or maple syrup as her sweeteners. This post will help: https://www.100daysofrealfood.com/2011/05/06/mini-pledge-week-9-no-refined-sweeteners/. I just made these brownies today, they are amazing! I replaced the sugar with 3/4 cups pure maple syrup, and decreased the eggs from 2 to 1. Awesome, awesome, awesome! Then again I love all your recipes. I don’t usually change them, only have three times. That’s not much at all since every single meal and snack I make is from your website or cook book. We are so happy they are a hit. You could make it like our cookie cake: https://www.100daysofrealfood.com/2013/01/16/recipe-whole-wheat-cookie-cake/. oh my these were delicious! just perfect. first time trying Enjoy Life Chocolate Chips too – loved them. never buying store bought ever again. super easy and quick to make, thank you! So good! Made them in silicone cupcake liners for my little guys 4th birthday, The recipe made 10. They came out perfect after 25 minutes. My new go-to brownie recipe. Used Ghiradelli Dark Chocolate Chips and baked them up in a waffle iron! So delicious and loved that they are a little lower in sugar than most recipes. Next time will try subbing some greek yogurt in for half the butter. Was there a reason why you chose to use sugar over maple syrup or honey? Hello. It is the sweetener that worked best for these brownies. I made them. They were super delicious. Love ur recipe. Now I realise that even I can cook (bake) very well like my mom. Thx for the recipe. BEST brownies I’ve ever had! Seriously. I under cook them (23-25 minutes) then try my hardest to let them cool before eating and they are the most fudgy delicious amazing treats in the world. Thanks for the recipe! Tried these tonight to experiment with using whole wheat flour for the first time and they were AMAZING! I always undercook them and they were gooey and so rich. The family didn’t even notice the difference. Thanks for the recipe! These are delicious and so easy to make. Thanks for the great recipe! I bet these could be a good gift in a jar..I’m going to experiment! Thank you for sharing! How did your gift in a jar go? I’m thinking of doing the same! Che w i e r not chequer! Darn autocorrect!! My family loves these brownies! I have a question – do you think I could freeze a batch and have them taste just as good when thawed? Hello coud I omit the chocolate chips? We’ve not attempted to do so and they are a pretty important ingredient. I didnt have chocolate chips but made them anyway. I was concerned by their looks that they would be too cakey, but I thought they were perfect! Meghan do you use the same amount of maple syrup as sugar in the recipe? Sub coconut oil for the butter. Trust me. Just made these and they’re amazing! I used 1/4 c maple syrup and 1/2 c sugar. I baked them in silicone muffin liners (made 18) and baked for 14 minutes. Could you use oil instead of butter? Hello. We often use coconut oil in recipes rather than butter. Could I sub flax seeds for eggs? Hi there. Other readers have but we’ve not tried it. I absolutely LOVE this recipe!! its so easy and they are so good!! Guittard chocolate chips are the BEST!!!! Love this recipe! HAve you tried making a big “mix” of these to have on hand? I am looking for a premixed batter using healthier ingredients.